Remember when you were in college (or even high school for that matter) and you took a class called Composition? We all had to follow some kind of standard formatting for our essays, whether it be standards set by the MLA (Modern Language Association) or APA (American Psychological Association). It’s no different in the world of publishing. There’s a “somewhat” standardized type of formatting writers follow when submitting work to be published. I say somewhat because all manuscripts, at least in their final form, are subject to a house style which is tailored to a publishing house’s individual preferences. But you can’t know that unless you’ve been sold, so to up those chances, you’ll want to make your manuscript as clean and professionally-presented as possible. You may not think formatting has a place in this, as your story, your ideas, your own unique voice will supersede anything as inconsequential as paragraphing or indents or the proper use of voice tags. But first you have to get that editor or agent to read your work. And if you’re making it too difficult for them to decipher what you’re trying to say, you may never get them to read past the first few lines. So make it easy for them, beginning with a few basics that are a part of ANY manuscript submission—fiction, nonfiction, poetry, or otherwise. Make sure your manuscript is the best it can be. Close all plot holes, make sure it has a catchy beginning and a satisfying ending, that your characters are compelling and human. That’s for another workshop, but you do want to make sure you’re happy with your manuscript before you send it off. PROOFREAD! Correct ALL spelling, punctuation, and grammar. This goes without saying. Be familiar with where you’re submitting. Check the publisher’s/magazine’s/journal’s submission guidelines for style and formatting. If you’re sending to a particular editor, check to see if they have an individual preference. I worked with a publisher once who did NOT like semicolons. I had to eliminate all from my manuscript. Most times you won’t know this in advance, but if the info’s out there, it’s up to you to find it. Plus it gives you an advantage, the more your know. Check to see if the publisher/magazine/journal is accepting electronic or paper submissions. They may have different formatting guidelines for each. Most now use electronic submission, but there are still several out there that only take paper, and there are differences. Okay, so you have your manuscript all spiffed up, and you’re now going to prepare it for submission. 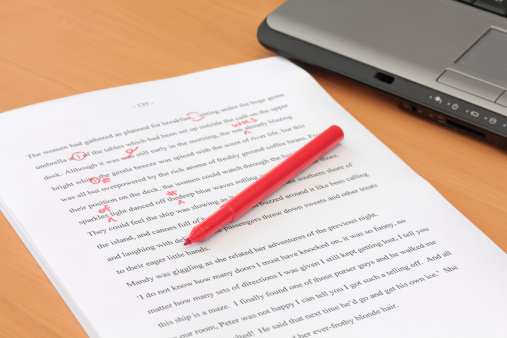 What would a properly formatted manuscript look like? I want to caution you that agents and editors as well as publishers, etc. may have different formatting guidelines, but most of what I am showing you is the general consensus of what an ms. should look like, and this is what has worked for me when I submitted. The publishing industry standard is MS Word, 12 point font (usually Times New Roman). The entire body of the manuscript should be double-spaced. TOP LEFT – Your name and all contact info, including address, phone number and email in single space. TOP LEFT IN HEADER COMMAND – LAST NAME/Title of Work (written like that.) If the title is long, just use the first few words. You need to insert Header in “Header” so this info appears on each page. TOP RIGHT – Start page numbering, starting with pg. 2, using “Insert Page Number” command so pages automatically advance. Leave the title page blank by using the command in Word. CENTER, SKIP A LINE – Title of Chapter (in italics, if you’re using one) The chapter number and title of chapter are open to style. Follow this formatting for voice tags: “I’m not going,” she said. “You’re not going?” he asked. (Comma after last word, followed by the end quotation mark, followed by the voice tag (she said, he asked) followed by a period, or additional info. The voice tag is part of the sentence. Do NOT add an extra space after the quotation mark, or Word will automatically capitalize the following word. Use * * * * * for scene changes within chapters, or # for change of POV or impact within chapters. So that’s what’s worked for me. A clean manuscript will keep them reading, but a sloppy one is just one keystroke away from the delete button. Keep them as far away from it as possible.